Bubbatrons-Big-Blog-O-Stuff: Terrain Geek Base Inserts - A Review ! First thing i need to say before any of my usual rambling is how grateful i am to Stuart at Terrain Geek for dropping me some free samples in the post to review ! In my nice package i was surprised at the amount id been sent, i was expecting maybe 1 or 2 base inserts but got a nice surprise on opening to find all these beauties ! So what i ended up with are (in no particular order ! 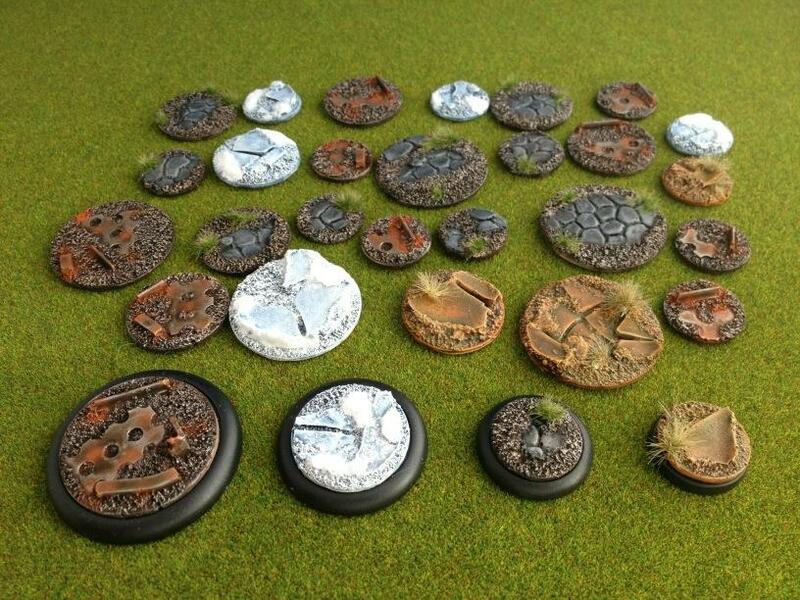 ): 3x packs of Broken Road Base Inserts (suitable for 30mm, 40mm and 50mm lipped bases), 2x packs of Ice Shard/Cracked Earth Base Inserts (suitable for 30mm and 40mm lipped bases) and 2x packs of Overgrown Industrial base Inserts (suitable for 40mm and 50mm lipped bases), also a nice little note mentioning the other types soon to be available, in total there will be Broken Road, ice Shard/Cracked Earth, Overgrown Industrial, Scattered Stone and Woodland - so a good selection for all kinds of minis ! The inserts also match up nicely to the existing line of round and round lipped bases Terrain Geek sell for very reasonable prices. The resin itself is a tough white resin, and after having a good close inspection i couldnt see any bubbles or miscast errors etc, so was quite happy to start with, now white doesnt take too good photos so i gave them a wash (causing no end of hassle off the wife for using up the last of the washing up liquid !! ), then once these had dried i gave each base a Sepia wash so the details can be better seen, so onto the pictures ! Next up we'll have a look at the Ice Shard/Cracked Earth Inserts, now these i got a different set of sizes compared to the Industrial ones - 5x 30mm base inserts and 3x 40mm base inserts, again lets have the obligatory useless white photos ! One of the first things i thought whilst looking these over was that realy they dont have to be used as ice, it could quite easily be substituted for broken paving slabs or even sheets of metal etc, allowing you to mix them in with other bases like the Overgrown Industrial ones above, again these have a sandy texture on them too so you could paint as snow/gravel/rubble/dirt etc etc, so these could be used for both SciFi or Fantasy bases, and i think for a themed army something like this with the obvious variety of styles will really make a difference on a force whether a large scale or skirmishy game ! Finally we get onto the last of the Inserts i was sent - Broken Road, now i got 3 separate packs of these containing 5x 30mm inserts, 3x 40mm inserts and 2x 50mm inserts, again lets have some pre and post Benidorm shots ! No those arent ginger nuts ! I think these are probably my favourites out of the ones ive been sent, ive been looking for something to base my Relics minis on and think ive found just what i need ! !, again like the Ice Shard and Overgrown Industrial you have some sculpted detail, in this case broken stones etc and again some sand like texture around them, just like the others though theres more than 1 use for them, i think these would work well as cracked earth with a lava effect on them in the cracks. well im very impressed with these, very nice casts, no errors i can see, no bubbles etc, and very reasonable prices too, there was another note in my package with the other sizes soon to be available and also giving the prices, but it did say 99% certain so may or may not change ! I think ill be getting several of these for myself, especially at those prices, will look really nice on my Relics Brittanan and Nuem forces, just need to make my mind up on which to choose !